I tend to accumulate a lot of books – sent to me by publishers and publicists – and they pile up on my desk until I have to make a trip somewhere. Because it takes a long time to get from Hawaii to anywhere else, I always grab a book or two from my stack to keep myself occupied while in a plane or while waiting for one. I was surprised that I had not come across her work before; she writes about topics that I am intensely interested in and has written for some sites that I read like Grist and Salon. But as far I know, this was the first time I had encountered any of her writing. Little describes her energy epiphany near the beginning of the book. Her “aha moment” came during the 2003 blackout in the Northeastern part of the United States; the largest blackout in recorded history. Suddenly Little saw a city without electricity for an extended period of time, and the paralysis she witnessed in New York City in the wake of the blackout drove home a very important message: We are incredibly dependent on the fossil fuels so many people love to hate, and life would not be a bed of roses without them. I described Little’s energy epiphany in my previous essay Democrats and Energy Policy. (She also covers these themes in this Youtube video). I understand the epiphany that Little underwent, because I had the same one many years ago. After my own epiphany, I didn’t consider myself any less of an environmentalist, but I more fully understood the broader implications of our use of fossil fuels. While there are undoubtedly downsides – in many cases potentially very serious downsides – I could not deny that fossil fuels have greatly improved the living conditions for many people. I began to see that while campaigns to limit the usage of fossil fuels in our lives may seem like the environmentally responsible thing to do, there is no free lunch. What I seek to do now is make sure people understand the implications of what they are asking for. If we limit our ability to produce energy, there are three choices: 1). We simply have to cut back on our energy consumption; 2). We import more oil, pushing some of the environmental consequences from our shores to the shores of countries like Nigeria; 3. We replace our fossil fuel consumption with alternative energy. The problem with many environmentalists resides with the third option. We could only achieve that through sacrifices and difficult trade-offs that are generally unrecognized. Little began her story by taking us on a history of oil production in the United States. I confess that I don’t know all that much about John D. Rockefeller, but discussion of his role in the development of the oil industry fascinated me enough that I want to read his biography. But one thing that struck me is that so many people still believe this is the way the oil industry operates; that a small group colludes to fix prices and rip off the American people. That’s just not the way the world works anymore; at least not in the U.S. Because U.S. oil companies are so small relative to the national oil companies, the impact that U.S. oil companies can have on oil prices is small and fleeting. (OPEC and Russia, on the other hand, are a different story). Little takes readers into a war zone in Iraq, where you quickly appreciate that the drivers of fuel convoys have some of the most dangerous jobs in the world. The journey again becomes historical, covering Churchill’s decision to switch the British fleet from coal to oil, the role oil played in the military actions of Germany and Japan in World War II, and the history of the relationship between the U.S. and Saudi Arabia. Using colorful and descriptive language that sometimes made me feel like I was reading Anne Rice, Little takes us to a NASCAR race, where she developed a sudden appreciation for why these races are so popular (why people watch car races or golf on TV still eludes me). She emphasizes the importance of oil in the production of plastics, something we often take for granted when we talk about our dependence for oil. She went through the history of Tupperware, which was interesting but wandered pretty far off-topic in my opinion. Inside the Pentagon, she learned that a $10 increase in the price of crude oil increases operating costs at the Department of Defense (DoD) by $1.4 billion dollars a year. She also learned that the world’s largest photovoltaic farm is on an air force base, and that the DoD — often criticized for their heavy use of petroleum — is also one of the world’s largest consumers of green power. She was told that 12% of DoD electricity derives from renewable sources. In an L.A. plastic surgeon’s office, she learned of the importance of petroleum in making silicone breast implants, but also in producing syringes, blood bags, surgical gloves and numerous other items in the medical industry. As an aside, she pointed out that in 2006 the FDA had quietly dropped the moratorium on silicone breast implants, having found no link between these implants and autoimmune disorders. I still recall in the early 90′s when lawyers were taking out ads in newspapers everywhere, inviting women to sue over a perceived link between the implants and autoimmune disorders. While good science ultimately won out, some lawyers are pretty crafty at making a living around bad science. Hot gas, anyone? The Dallas-based entrepreneur, who has relentlessly promoted his “Pickens Plan” since July 4, 2008, announced earlier this month that he’s abandoning the wind business to focus on natural gas. Knowing how things turned out for Pickens, you might be just a wee bit more skeptical of her vision of how the future is going to play out. And I think many of the stories that Little covered — this greening of power in America — are likely to turn out the same way. Where she sees renewable energy technologies improving until they dethrone fossil fuels, I see fossil fuels becoming so expensive that renewables gradually become competitive. That’s a much different vision than the one she lays out in the book. (However, I should point out that she does support offshore drilling; undoubtedly a result of her energy epiphany giving her a better understanding of our energy predicament). Little did cover a number of interesting developments in Part 2; some of which may ultimately make a big impact. One of the most interesting to me was her coverage of developments in green building. She discussed Brad Pitt’s Make It Right foundation, which is building 150 green homes in New Orleans’ Ninth Ward that was so devastated by Hurricane Katrina. She told the story of a new home owner whose energy bills had dropped from $500 a month to under $100 a month in her new home. But Little also covered green building developments for commercial buildings. She said that globally, buildings account for 40% of all energy usage, and in the U.S. they consume 30% of all raw materials and produce 30% of our landfill waste. She covered the technologies and developments that are designed to drastically reduce those numbers with a visit to the Bank of America Tower in Manhattan — which received a platinum rating from the U.S. Green Building Council (but cost $1 billion to build). As I read this book, I began to think of it as a layman’s guide to understanding the real role that energy plays in our lives. This book should be required reading for anyone who still believes that oil is a four letter word. It won’t necessarily change your mind about oil’s downsides, but you will certainly come away with a greater appreciation for the role it plays in your life. And even if you are well-informed on energy issues, there is still material in the book of interest. I gauge a book by whether I learned something new and interesting, and whether I believe the book’s factual claims are generally correct. Power Trip passes on those counts. It is a book that I can easily recommend, especially for someone who is starting from a lower level of energy proficiency. If only we could get people to understand who the modern John D. Rockefeller is on Wall Street. Let history give us another lesson. Some conservatives will call it a coincidence this all happened in the Bush administration, while the liberals will call it a conspiracy. They shouted with joy for the changes to come with the Obama administration…and yet little has changed as to who owns the Rockefeller and Morgan legacy. I’m glad this little lady had an “energy epiphany”. They can be nade with celluose. Cut the comedy…..
NOT oil and Briggs and Stratten lawn mower engines. …suddenly realizes that electrical energy is far more important to the actual world we live in than oil ever thought about being. No question, electricity is vital to our quality of life, but transportation would be dead in the water (literally) without liquid fuels. Look around your house. If you’ve got something, chances are very high it got there, or to the place where you bought it, on a truck burning diesel fuel. Air travel? Good luck flying across the ocean, across the country, or even to the next city without airplanes burning liquid fuels. I’ll go out on limb here and say you will never see a battery-powered airliner that can fly from New York to Amsterdam. Barge traffic on our rivers and waterways carries bulk commodities such as grain, coal, cement, timber, etc. It will be a long time until we see an electric tow boat pushing 24 barges up or down the Mississippi. Cargo ships crossing the oceans? Don’t ever expect to see a battery-powered container ship going from Wilmington, NC to Rotterdam. Do you think you could live with-out the “Grapes Imported from Chile’ sticker on the produce you buy ? In other words, do you think that you could live on produce actually grown in the U.S.A. ??? Of course I could — and mostly do. But that doesn’t mean we don’t need ships carrying stuff across the oceans (For example, Midwest grain loaded in Duluth, MN going through the Saint Lawrence Seaway to countries with hungry people), and diesel-powered tow boats pushing barges full of grain, sand, cement, and other heavy commodities up and done the Mississippi and Ohio Rivers. Ocean liners and cargo ships burn bunker oil — we aren’t going to see them electrified, and going back to using sails is possible, but not likely on a large scale. We could — and should — see wider use of electric trains as they do in Europe, but it would take a massive infrastructure investment to electrify all our railroads. I agree electricity is vital, but our current transportation system runs on liquid fuels. Or you have your own and realize that if electricity disappeared tomorrow, life as we know it would change dramatically and millions would die. If oil disappeared tomorrow, billions would die. I just think it’s hilarious that you even continue to maintain this, given your acknowledgement that 2 billion people already live without electricity. Without oil, the carrying capacity of the world might not even be 2 billion people (but I suspect we could manage that). If you look at the history of electricity consumption, it was still quite low at the end of WW2. Yet the global population had already reached almost 3 billion, and oil had enabled the allies to win the war. The bottom line is that I recognize the importance of both. But you are operating under the delusions that oil can be easily replaced. It is you that requires an energy epiphany to realize just how dependent your life is on oil. Maybe you should pick up Power Trip. I am fast coming to the conclusion that you don’t have the faintest idea what you are talking about. There are some plastics that can be made from biomass. That doesn’t begin to cover a fraction of the types of plastics we use (nor the scale at which we use them). So you are quite confused about the difference between the ability to produce some very specific types of plastic from biomass, and replacing the category of plastics with biomass. That’s like saying that jet and marine transport can continue to run without oil, because we can make ethanol from cellulose. Number 1, we can’t make it economically, and Number 2, there are very good reasons that marine transport doesn’t run on ethanol. Since those are analogs for electric motors — not fertilizer, pesticides, or combustion engines — then we know (according to your logic about bioplastics) that we can continue just fine without electricity. We just need more water-wheels. After all, a water-wheel can perform the work of an electric motor, therefore it can replace all electric motors. Right, plastic man? If you look at the history of electricity consumption, it was still quite low at the end of WW2. Roger that. The foster family that raised my father didn’t get electricity on their farm until I was about 7-8 years old. I remember visiting them when I was small and sitting in a living room lighted by kerosene (made from oil) lamps, and listening to a radio powered by a car battery. They also cooked using a wood stove, and kept their milk cool in a tank of cold water from their well. But even though they didn’t have electricity to their house and barn, they did have a car and a tractor fueled by gasoline — and considered them essential. Yet there are billions who don’t enjoy modern civilization or electricity and yet their populations are propped up by oil. I think the problem is that you need to get out more; see the world. See how people live around the world. Go to Africa. You will see the difference in modern civilization and life-sustaining. I suspect I have a much better grasp on the global energy situation than you do, and my opinion is that you are simply uninformed. To be honest, I am shocked that you brought it back up, but that’s your hang-up and I really can’t help you there. But I can assure you that you haven’t budged me an inch off of my point. I know I am right. So you should probably drop it and move on instead of simply repeating your earlier claims. When the electricity goes off, I will no longer have R-Squared Energy Blog. But when the oil goes off, you will probaby die. As others pointed out before, it’s apples and oranges in any case. Electricity is an energy carrier, and we make plenty of electricity without fossil fuels. So let’s say all fossil fuels vanished tomorrow. We would still be able to produce electricity at about a third of today’s rate. So while you might not have Internet, critical industries could continue to operate. But the plant operators wouldn’t be able to get to work, because lack of oil would shut down the entire global transportation infrastructure. Not only would you not be able to get to the store, the food wouldn’t be able to get to the store, and the yields of the food that did get into the market would plummet as indicated by the Kansas corn farmer in the story. But when the oil goes off, you will probably die. Please explain how my father’s foster parents (see my above post at 12:35 pm) were able to live without electricity well into the 1950s. Have you ever heard of the TVA? (Tennessee Valley Authority) Before the TVA started building dams on the Tennessee River in the 1930s and 1940s, most of the people living in the Tennessee Valley had no electricity. By today’s standards their lives were hard, but they didn’t die. Just go out and throw the main breaker.to your house, After 30 days without power, call me back. I have already exlained this to him, as well as the fact that billions live today without electricity (but not without fossil fuels). So his point is demonstrably invalid. It’s like arguing with a fence post, except in addition to not listening or acknowledging the points, the fence post just repeats same refuted points. He seems to be unable to differentiate between electricity supporting our modern lifestyles and oil keeping most of Africa alive — even though they are mostly without electricity. Yes, life without electricity would be harsh. No Internet, no microwaves, no air conditioning. 30 days of that would be unpleasant. 30 days without oil? People would be dropping like flies. Or, you could stop eating anything that was brought to you via oil, and completely give up oil-based transportation. After 30 days, you wouldn’t be able to call back. Well, at least she started right by separating the history/facts from her predictions/opinions. Sounds like she learned lots, from a small start, about just how all pervasive energy use is – I don’t think there are many who would argue that. When it comes to predictions and opinions, of course, it is a whole different story. As for renewable energy, it will continue to find its niches to become sustainable business (as micro hydro, anaerobic digestion have done), but I think to say it will dethrone fossil energy/ the powers that be is a bit of a stretch. Renewable energy can play in the same game, but it is a long way from being anything other than a minor player. The examples of the green buildings are not necessarily examples of the way forward. Many of these ‘flagship”green buildings are so expensive to build, that they merely prove that most people/companies can’t afford to build them. The New Orleans houses are another example, they are built to be flood and hurricane proof, but at such a cost that the only way those people can ever have them is if they are donated – but how scalable is that? Despite decades of development, countless demonstration projects etc, “green building” in the form most hyped in the media is simply expensive, complicated luxury that few people and businesses can afford. It is not sustainable if it is not affordable. 30 days of that would be unpleasant. 30 days without oil? People would be dropping like flies. To say that filling up at the local gas station is more important than hundreds of dollars worth of food rotting in your fridge borders on the absurd. Sounds like another clueless journalist trying to sell a book. Everyone is an ‘environmentalist’ but none of them base ideas about the environment on reality. Take for example the idea of ‘green’ buildings. First, I suppose you can find a few drafty old houses that heat with oil to achieve returns like that. Maybe I could save $50/month on my electricity for my 30 year old house compared to a new house built with all the practical energy saving ideas. Just for the record the good place to go is your electric utility’s web site for ideas. It is free too. Second, if you measure air quality in a tightly sealed house I am not sure how ‘green’ you would call it. Indoor air quality and radon issues are the result of conservation. Third, if the building is all electric, reducing energy is not ‘green’ if the energy is produced without environmental impact. Since we do not use oil to make much electricity, we can skip oil issues. I maintain that producing electricity in the US has insignificant environment impact. Putting the pollution controls at the power plant is a lot easier than in buildings. I would suggest that using a little more electricity to reduce mold and mildew improves our living standard. At least in all electric homes, reducing your standard of living by using less energy will not improve the environment. Enjoy! Straw man. Those people without electricity don’t have fridges; but they do have food. It isn’t rotting food in your fridge that will kill you. In fact, I can eat fine without even owning a fridge. It’s the growing of the food and moving it that is the problem you don’t seem to grasp. It is also a grotesque strawman to suggest that what you would give up by giving up oil is filling up at your local gas station. What you would give up are the majority of the world’s crop yields and the ability to transport what remains. Your response to these points has only been “BS” or “Nonsense.” So far there is zero substantive response as to how you would feed 7 billion people without oil or natural gas. But don’t worry, I don’t expect that you can offer one, so “BS” it is. I presume you’re also excluding coal, since it’s easily if expensively substituted for oil/gas in most of those critical applications. Excluding all fossils, things are harder but not impossible. The key feedstock for nitrogen fertiliser is actually hydrogen, which we can produce inefficiently from electricity or somewhat more efficiently via thermal processes. In principle we can therefore use nuclear or solar power to meet those needs. Plastics and other chemicals I believe we could derive from biomass sources – there is at least no law-of-physics reason why this can’t work, and the scale is much smaller than transport. If you buy the foregoing, that brings us back to transport. For long-haul transport it seems possible to use nuclear-powered ships and electrically-powered trains. Yes, it would take longer to get anywhere, but going back to 1920s travel times isn’t the same as the end of civilisation. Arguably we’re better off since telepresence can make up for at least some of the loss. Short-haul goods transport and personal transport remain problematic, as well as applications such as heavy equipment, farm machinery, etc. Vehicle electrification has potential for some portion of personal transport, with estimates as high as 80%. Could the rest (heavy machinery, short-haul trucking, and busses) be within striking distance of our ability to produce biodiesel? What about biomass enriched with hydrogen to produce energy-rich liquid fuels? It doesn’t seem impossible. I presume you’re also excluding coal, since it’s easily if expensively substituted for oil/gas in most of those critical applications. Excluding all fossils, things are harder but not impossible. Doug, in the longer term we can make enormous changes if we absolutely had to, and many things would be possible (but as you say, likely much more expensive). My point is that at present a large fraction of the world’s population is fed, clothed, and housed by oil. That is the status quo. If oil and natural gas disappeared tomorrow, billions of people would die in less than six months. Of course oil and natural gas won’t disappear tomorrow, but it makes me very uneasy to think about so much of the population being so dependent on our declining reserves of fossil fuels. You can’t take a little ” heat ” from a long time reader ? Did that and you can keep transportation by jet. For those are concerned, can stop worrying about about not having electricity except for a short period of time. We are too good to let that happen. Listening to RR I might be a little concerned about oil and gas but I suspect most in the industry are too busy getting the job to let it happen. What I am worried about is the next essay about journalists who need a short outage to learn that they depend on energy. There are a number of things that can be done, but most of them require a paradigm shift. Examples: http://www.thenaturalhome.com covers a house design that is fully self heating or cooling over 95% of the continental US at less than the cost of a standard house – but it doesn’t look like a house to us. Annualized geo solar can provide heating except in swamps or solid rock, but is about 10% more expensive. A new house is too expensive for most people, tho. Personally, I’m blowing summer air through the basement – cheap cooling and the soil temperature has risen enough that the pipes don’t freeze in midwinter anymore. Also the south roof is being stiffened, so that when solar PVT becomes inexpensive enough, this century old house can use it. Per food, read books by John Jeavons, Andre Poisson, Eliot Coleman, Mel Bartholomew, & others. Of course, this needs us to work at raising and preserving our own food, but productivity is very high. Been using these methods for thirty years, very effective. Travel & transporting goods are a problem, but look up the J-pod system, electrified railroads, etc. RR has it right, and maybe Little does also – as fossil fuel prices rise, renewables and alternatives will become competitive, but changes will not be minor. While it is possible to do things like what you say to a free standing house, what about the millions that live in city condos and apartments? They have no means to do any of that, and they keep space available for others to do that, because they are no consuming space themselves. Cities function very well at keeping large numbers of people in a relatively small area, as long as they are supplied with inputs – which are produced efficiently by farms outside them. There is no amount of backyard gardening that can produce any significant fraction of NYC’s food needs. If everyone tries to live in a detached country hosues with garden all around, the sprawl will beciome immense. There are also millions of tons of methane frozen in the clathrate hydrates under the oceans. Difficult to get at and extract, but in a crunch, it’s there for the taking. The Japanese are one of the only countries that has been working on ways to use them. Just might come in handy as a way to replace the nuclear power they’ve lost. Wow Paul you are so funny. That looks just like where my grandparents on Main Street. Looks like the church where I was baptized. Different town but what are the chances there is an Elm Street, Mill Road, and Canal Street? Everyplace has a history. The small farms, the mill near running water, the Erie Canal to move the corps to NYC. Freedom was not about commuting from the factory in the city. Freedom was about migrating west for new opportunities. WWII and the GI Bill changed how how we live in the US. The small town where I was born has not changed. It is just like I remember except they rebuilt the grade school. Great place to raise kids. Of course I understand why my dad moved to Seattle. The availability of provided new choices but most of America is still small town that is not sprawl. of legislation and support it. No Wendell ‘methane frozen in the clathrate hydrates’ is not an energy source. Could it be an energy source if we run out of coal and fissionable material? Since we are not going to run out of the latter, who cares. As Wendell likes to point out the only thing holding back ‘methane frozen in the clathrate hydrates’ is the corn lobby and special interest groups. Wendell try to understand the difference between doing and not doing. Japan will import more coal and LNG in the short term. Then they will build more new nukes, putting them on higher ground. They could import corn from Iowa too. Unlike ‘methane frozen in the clathrate hydrates’ burning corn for energy is something people actually do. I do not know how much coal they have in Australia but the US will happy to ship coal to Japan. @ Walt, thank you and I agree that the Open Fuel Standard is a good thing. Especially for methanol, it will bring it into the mix as an oxygenate and hopefully a mixed alcohol standalone fuel as well. Mark, I assume you are also supportive of this because of your Montana mixed alcohol product produced using beetle kill biomass as a feedstock? The problem we are talking about is the strategic value of oil. Electricity is not a strategic commodity, because it can be made from a variety of sources. The US is completely dependent on oil for 96% of our transportation, yet we only have 3% of the world’s oil reserves. Most of that oil comes from petro dictatorships that are hostile and want to eliminate the US. In essence, we are paying for both sides of the wars that we are currently fighting. Contrarily, with electricity, we are not only much more diversified, though 50% of electricity produced in the US comes from coal, at least we domestically produce ALL of the electricity that the US uses right here in the US. With oil, especially in regard to transportation, there are currently no viable alternatives available in commercial quantities. Ethanol is the only thing making a small dent at 13 billion gallons produced in the US last year. In contrast, US biodiesel production was about 350 million gallons… This is why it is so important that we diversify our transportation sector off of oil. I didn’t say that — or even infer that. The main problem with methane clathrates is the difficulty of getting to them and getting the methane out –more difficult than what we have to now do to get oil from the deep ocean. But it is there in quantities that would solve our energy problems for a long time — if we ever have the technology, will, and need to go after it. There is one other big problem: The environmentalists don’t want us to tap into the frozen methane under the oceans. They want the carbon in that methane to stay right where it is. So even had we the technology to use it, politics might not permit it. Mark, I assume you are also supportive of this [Open Fuels Standard bill] because of your Montana mixed alcohol product produced using beetle kill biomass as a feedstock? Yes Sir! Mandating that all new vehicles sport a (adjustable?) FFV chip which allows motorists to choose gasoline, methanol, ethanol (or other stronger BTU alcohols???) makes a lot of sense. And this Federal Statute being presently discussed should cover imported cars as well as autos and pickups produced domestically. I’ve previously posted here that I believe very cheap factory FFV chips should become standard automotive equipment. Why should it take a Federal Law to implement this? Why wouldn’t Detroit’s Big Three jump into this voluntarily? We are only talking here of a $35 Flexible Fuel Vehicle chip plus elastomer & fuel system compatibility with alcohols (maybe another $100 max). This should be a no brainer. FFV technology is more than 25 years old… If domestic Energy Policy is in any way attempting to prepare for Peak Oil while simultaneously working to import less Crude Oil from other parts of the world – just seamlessly adding C1 methanol OR C1-C10 higher mixed alcohols into the general fuel pool along with C5-C10 hydrocarbon gasoline and C2 corn ethanol makes perfect sense. Oxycarbon Methanol features 56,000 BTU’s / gallon. It fueled the Indy 500 Race Cars for 37 years until being politically replaced by EtOH about 4-5 years ago. Corn Ethanol provides 75,500 BTU’s and Higher Mixed Alcohols features at least 90,400 BTU’s and 130+ octane. Most gasoline provides 112,000+ BTU’s. The Open Fuels Standard bill requires 95 percent of cars to be capable of burning gasoline, ethanol, and methanol in any combination by 2017. So each car will be capable of burning any and all of these liquid fuels. Or the car could be electric, hydrogen, natural gas, bio-diesel, or any other non-gasoline-burning car. The bill is being referred to as the all-of-the-above option, or a technology-neutral bill, meaning that it doesn’t favor any particular option, but allows the market to decide where innovation can lead. Carbonaceous feedstocks to cleanly produce C1 Methanol or C1-C10 higher mixed alcohol ENVIROLENE® via GTL (gas-to-liquids catalytic synthesis) go far beyond beetle-killed pine trees – yet there are millions of acres of these standing dead pine trees available PLUS out of work foresters ready to harvest them for the next 35+ years… In western Montana, we’ve been discussing $50/ton for pine chips delivered to central sites against the railroad… This harvesting technique would be a little bit different – same foresters would become Johnny Appleseed too — and replant seedlings as they covered their tracks in these eco-damaged forests. This increases costs beyond $50/ton for pine chips – yet it will still pencil – and it is the right thing to do – even when Montana coal might be purchased for $35/ton and provide 1/4 more BTU’s per unit volume. Additional carbon-bearing feedstocks to produce C1 Methanol or C1-C10 Higher Mixed Alcohols via GTL synthesis include municipal garbage, sewer sludge, coal of any rank, petroleum coke wastes, ground tires, other agri-biomass wastes, plus methane natural gas and waste CO2 greenhouse gasses. All of these solids or gasses provide those Carbon atom building blocks as basic feedstock to produce new oxycarbon alcohols which blend with gasoline in any volume c/o $35 factory-installed FFV chips. The basic Carbon atoms tow along little Hydrogen ions in their magnetic valence and the missing and key Oxygen atom which converts float-on-water Hydrocarbons into water soluble, oil soluble, coal soluble, biodegradable fuel alcohols – comes from H2O water. Not rocket science here! Yet not easily understood by the consuming public, NIMBY’s or most of our elected representatives!!! Oh, I almost forgot! None of the above list of carbonaceous alcohol fuel feedstocks needs to be planted, fertilized, copiously watered, weeded nor annually harvested on premium or marginal lands. Let’s grow food instead!!! Carbon is carbon is carbon as a liquid fuel building block. Switching to super-heated steam as a continous THERMAL front-end process driver instead of using acid enzymes and biobug yeasts via batch to batch cooking, fermention and expensive distillation — will soon catch on! Joe Sixpack and others really have no clue. Simply examine today’s newest IPO’s in biofuels as evidence of how little people actually understand as they open their wallets hoping for new fuel miracles. And then there are those promoting Ethanol & other Green Chemicals… Wonder what these other Green Chemicals could possible be? Anybody know? The U.S. is not going to replace gasoline with a new liquid fuel(s) for a number of reasons. Building a new distribution infrastructure is expensive and has to compete with the existing gasoline distribution. The consumer has collectively shrugged at E85 and the prospects for other fuels are no better if not worse. FFV compatibility is not a selling point for Detroit and, more importantly FFV drivers don’t think about ethanol unless there is gasoline price spike. The coffee shop crowd pushes technological advancement in this country (see smart phones and tablet pcs), they have a definite bias against liquids fuels. The performance characteristics of the electric engine (instant torque) will add to its appeal/marketability. I’ve previously posted here that I believe very cheap factory FFV chips should become standard automotive equipment. Why should it take a Federal Law to implement this? Why wouldn’t Detroit’s Big Three jump into this voluntarily? We are only talking here of a $35 Flexible Fuel Vehicle chip plus elastomer & fuel system compatibility with alcohols (maybe another $100 max). This should be a no brainer. I think this would be a great thing, but wonder how it would work at the retail level. I can’t see gasoline retailers putting in infrastructure to sell gasoline, ethanol, methanol, and mixed alcohols. So how do you envision that this would go down? Entirely separate retailers for (e.g.) methanol? Or some retailers who only sell gasoline and mixed alcohols, or only mixed alcohols? Excellent clip. I have to check her out in a bit more depth. I knew the name, but not really the things she stands for. Quite similar to my own views, from what I saw in that clip. When considering the importance of energy on our daily lives, looking at life expectancy is interesting. Rich countries can afford reducing pollution. So can we reduce that by concervation? Fig 1 show relative risk and perception. The important thing to remember about risk is that it can be managed. You can chose the route, for example, that you ride a bicycle to work avoid heavy traffic and associated pollution. RR: I do not envision any additional NEW gasoline station infrastructure than it takes to presently retail E-85. If a FFV chip were to feature a motorist glove-box calibration setting – then a new FFV chip can automatically adjust for different oxygen and BTU contents contained in C1 Methanol/gasoline or C2 Ethanol/gasoline or C1-C10 E4™ Higher Mixed Alcohols/gasoline blends. The trick here is to pre-program the NEW FFV chip installed at the factory. Methanol at 56,000 BTU’s features 50% oxygen. Ethanol at 75,500 BTU’s contains 33% oxygen content. E4™ ENVIROLENE® higher mixed alcohols at 90,400 BTU’s contains 34% oxygen content. A standard FFV chip today is calibrated only for C2 Ethanol which would feature 33% oxygen content in the neat fuel. And the chip ‘reads’ dissolved oxygen in the gasoline/alcohol blend. So the chip therein first adjusts air/fuel ratio squirts from the fuel injector. THEN the spark ignition timing is next automatically forwarded WAAAYYY upwards to compensate for much higher octane in all of these fuel alcohols — and this is where the extra-punch to the accelerator pedal comes from plus drastic reductions in exhaust emissions. So IF the motorist sets a glove-box switch for Methanol or Ethanol or much stronger BTU E4™ Higher Mixed Alcohols – everything else becomes automatic after that point. The chip ‘knows’ what BTU value alcohol is providing “x” percentage content of oxygen dissolved into the alcohol/gasoline mixture. Of course, the retail price would differ if M-85 were pumped out of the flex-fuel nozzle in comparison to E-85 or E4™-95. The service station pumps WHATEVER flex fuel blend it can get its hands on. And the motorist’s car or pickup simply runs this gasoline / alcohol blend at 10% to 85% volume percentages. Of course, the price for different alcohol/gasoline blends would vary. I think you’re also overestimating the flexbility of the service station. Can an E85 tank-pump just be switched to methanol? The station is going to have to cast its alternative fuel lot. Furthermore, what motivation does a station have to “get its hands on” an alt fuel (unless there is a legal mandate)? The only reason to sell any liquid fuel is to get customers to buy higher margin items. Gas stations are going to continue to be ambivalent on alt fuels unless they bring in more foot traffic. The consumer wants/needs standardization and is willing to pay for it. Well, the idea here is that the engine management system does the standardisation, to get similar performance and efficiency out of any of these fuels – this is quite achievable by the methods Mark described. In fact, on the alcohols, the thermal efficiency in miles per btu will be better, as they are inherently better fuels for a gasoline ICE. So, if the engine does the standardisation, and the consumer is confident in the engine (because the car companies have throughly tested/developed/warrantied them) then the question then becomes, is the consumer willing to use the alt fuels, and pay less for them? The Brazil examples, where many cars can run on anything from E20 to E100, suggests they will. Many people have cars that can run on premium or regular gasoline, and run better on premium, but choose to run them on regular unleaded, just because it is cheaper. They will trade the 1 sec increase in 0-60 time for 5% less $/mile. If they are then towing something, they will spend the extra on that trip for premium for the extra performance – I know one guy who does just that. Yes they do want to say that, but for many customers these days, they want to save $. The car will adjust for the fuel automatically, and for working out the equivalent mileage, well, “there will be an app for that”, so that you don’t have to trust the car dealer! I think you’re also overestimating the flexbility of the service station. Can an E85 tank-pump just be switched to methanol? Absolutely, as long as the pump can handle methanol in the first place, it can handle all the rest. A new fuel type (e.g. methanol/mixed alcohol, E85) can be stored in an above ground tank, at places that have the space (e.g. rural stations)- the fuel provider might even provide said tank – that’s what Coke does with its fridges. A tight station in an inner city location would be different, but just because you can;t do it everywhere, right away, doesn’t mean you can;t do it at all. The independent gas stations have been the fastest adopters of E85 (with the possible exception of Valero, who now own 10% of US ethanol capacity), and I expect they would be the fastest adopters of any other alt fuels too. When you have alternate suppliers of alternate fuels, you have some supplier competition that doesn’t really exist today. They will have to finds ways to make the retailers want to sell their product – making it more profitable do so would be the best way. the independent retailers have this ability – an Exxon owned stn does not. With the current public attitude towards the big oil cos, I expect that – to be able to buy an alt fuel, from a retailer who is not big oil, that is cheaper, and that your runs on just fine – will be quite attractive to many people. And if all new cars can handle it, the change is enabled, and it is up to the drivers to decide which fuel they will buy. Personally, I don’t think they will pay more, to Big Oil, for “standardisation”. I actually think they will pay a little more to be free from Big Oil, and if they can do it while paying less, well, anything could happen. She gave this talk entitled “Energy Security” on C-Span – to the 30th National Conservative Student Conference on Aug. 4, 2008. The film is 1 hour 5 minutes long. I wish every American would be forced to read this book, or one like it, in high school. Where I live, fracking is HUGE drama right now, and I can not count how many times people have called into the radio to say things like, ‘we should not be using natural gas and oil since we have renewables’. Thank God I do not know these people in real life, because I have absolutely no words for such remarks. The consumer has collectively shrugged at E85 and the prospects for other fuels are no better if not worse. True they have, but during a time when oil is abundant. I’m going to guess if it’s a choice between using ‘xyz’ to fuel your car or doing without, the majority will choose using xyz. Now we just have to figure out if there actually is an xyz. Well put. If there was another 1973 style embargo, and rationing on gasoline was imposed, but not E85, I wonder what would happen? It’s probably safe to say that quite a few people would put E85 into their non flex fuel vehicles, rather than do without. This, of course, is in contravention of the EPA vehicle emissions regulations – but given they don’t really enforce them today, they probably wouldn’t then. RR, I do not understand how you can continue to say things like ‘the population will fall to under 2 billion without oil’ and NOT be a complete doomer. That’s not what I said. I said that if oil disappeared today, we would certainly see a multi-billion person die-off. I have no doubt about that. So this is a risk hanging over us. Fortunately, oil isn’t going to disappear today, and I believe that we can make some tough sacrifices and avoid these terrible scenarios. Note that I am not predicting this; I am just pointing out the status quo. I have said many times that I really don’t know what the sustainable carrying capacity of the earth may be, but I know at present that most of it is propped up by fossil fuels. That situation can’t last forever, so either we adjust accordingly or Mother Nature solves the problem. It would be wonderful if you could do any research on Ms. Korin and the organizations behind her efforts. When I first saw the Open Fuel Standards Act website last week, I could not have been more pleased. Then as I dug deeper my joy turned into sorrow. I will not expand. Let’s say that when the Methanol Institute became largely the lead sponsor and they represent to two largest importers of Methanol into America, I do not see any way we should shift our “crude oil” imports to “methanol imports”, but this is exactly what is going to happen. I have worked in this methanol sector for more than 5 years, and it is absolutely controlled by Methanex and several importers. You think OPEC is evil and should be hated by every American, that is fine for those who want to teach and preach this doctrine. However, I am not convinced turning over the blending into the hands of Methanex and a few importers is the best option for America. I agree we need choice at the pumps, but I would rather encourage everyone to understand why those of us who produce methanol here in America are having such a difficult time getting any support. 2) Unless you build jumbo scale plants in America, you will not compete with Methanex and other cheap importers. Thus, what is being argued as a way to eliminate crude oil imports with the replacement of methanol imports makes little “American” sense…but it will be politically correct in DC to support political forces working behind closed doors. I understand this is how the system works. 3) I wrote to their new website, but only before I realized who was behind the effort. I do not expect any response now that I realize what is behind this new push. I was really hoping for an independent organization who supported American companies trying to create American jobs with allowing access to these consumers. This legislation will be create the access to consumers at the pumps, but it will come from methanol imports as there is no way that ethanol can compete without subsidies. I really hope you will try to do what you can to be independant in your evaluation of this legislation and see if it will be good for consumers, and as a means to eliminate foreign crude oil imports due to the alleged OPEC evil controlling America. I wonder how much oil is imported by traders and bankers in America rather than OPEC countries directly? What countries actually deliver crude to America and control distribution? I guess I know the answer. Beyond the hype, what does it mean to replace crude oil imports with methanol imports? I know what it means to our company…so call me biased and cautiously skeptical. Mark, I would not leave it to the Open Fuel Standards Act passage to insure access to these consumers for either mixed alcohols or domestically produced methanol. In the last two meetings I’ve had with those working directly with the station owners, once before this legislation was brought back into front and center on the political agenda and once after it was resubmitted, I see now much more clearly what is in the works. I think we should not be blinded by the press releases and press statements without doing more research on who is behind the legislation and why. Again, let me be 100% clear as I know I will get some nasty emails from my posting on this blog. I’m very supporting of giving consumers choice at the pumps. However, I recognize that the ethanol lobby has worked tirelessly to get into the gasoline pool with their 10% and 15% mandates. Beyond the problems caused with small engines, which I learned recently are really not effecting all engines except the oldest ones, I expect the chance for domestically produced methanol and mixed alcohols will not make it to the consumer. We are not talking about producing crude oil or natural gas in America. These are commodities…bought and sold daily…and can be hedged against price risk. Methanol and Mixed Alcohols are not traded outside a small group of importers and foreign producers. There is a major rush right now as I hear in consolidation by the major brand name companies to buy up stations, or consolidate the market. While it is possible we will get access to the pump from a general market press statement, I think our best shot is the fleet industry. Your fuel has the best chance to get into fleets and win the hearts of the drivers and mechanics. Methanol does not have the great of chance, although, I do believe there will be opportunities. It will all depend on the lowest price domestically to compete with importers. Prices even in the oil fields now are still less than $1.50 per gallon. It means one has to be selling locally at $1.25-$1.30 per gallon to take those supply contracts. Look at the history of methanol prices. They are low now, but they went to $850 a ton just before the economic crises of 2008. Even during this years maintenance schedule they kept prices very low…perhaps out of demand problems, but I suspect they were planning to bring back to life the Open Fuel Standards Act and with the Methanol Institute taking the lead role I imagine nobody wants to see $850/ton methanol. People argue that methanol is tied to natural gas prices, so if natural gas is low so are methanol prices. This is not true necessarily true. Methanol prices are tied to crude oil prices. Here is a good explanation…although you can find many on the web. resulted in Methanex’s global market share slipping from 20% to 17%). So depending on how you view methanol imports, and how you consider mixed alcohol pricing index, I would not believe the press when they argue that low natural gas prices guarantee low methanol prices from Methanex and other importers. The only way I can guarantee fixed priced, low cost methanol is to own the gas fields, or fix the natural gas prices with the supplier. Not attractive for investors if the future price of methanol can go to $850 per ton with crude oil prices…or demand at the gasoline pump. I can tell from experience that they are against specific renewable energy projects in their backyard. My wife and I were invited to a pot luck because of out interest in renewable energy and the environment. We watched an old black and white movie that was pure communist propaganda out of the Stalin era. Workers unite and all that. Apparently the way to save the planet it to live a dreary life and eat boiled cabbage. I did not attempt to explain the dismal environmental record of the USSR and China. Prosperous capitalists want clean air and water. The marginal coast of producing energy cleanly and safely is low. It is just good business. If fact if you look at China and the USSR the cost of not doing it are high. Pay less? Where are the alt fuels that are cheaper than gasoline? If its not cheaper people will pass as we’ve seen with ethanol. Standardizing a new class of compatibile fuels may be technically easy but marketing this to the consumer is complex. Brazil illustrates that there will be a clear alt fuel standard. In this case ethanol. Absolutely, as long as the pump can handle methanol in the first place, it can handle all the rest. Ok, how many pumps-tanks are methanol compatible? The independent gas stations have been the fastest adopters of E85 (with the possible exception of Valero, who now own 10% of US ethanol capacity), and I expect they would be the fastest adopters of any other alt fuels too. I wouldn’t rest too much hope on indenpendents they have been in a steep decline for a decade now. Again this microrefinery concept seems unlikely. High capital costs, low relative output, and razor thin margins aren’t a good mix. Not to mention, your main competitors are the most profitable companies in the world. I don’t think gas stations will turn into bars, with drivers asking “What do you have on tap?” Beer is a (relatively) high margin refined product that is easy to produce and we see that in the product mix available, fuel is not. Thomas, my research shows that almost all of them will handle up to about 15-25% alcohols at the pumps without further modifications. The installers I know of both pumps and tanks have made lots of changes since the introduction of 10% in the gasoline. I am told there was a lot of failures when they first were hit with the ethanol in the gasoline, but almost all of those fixes were completed. What I understand is that it is likely the current fixes could support maybe up to 25%, but nobody knows until they try. The E85 or M85 blends absolutely cannot use current pumps. They need totally separate hardware. They pay now about $6,000 here in my part of Michigan to upgrade the pumps, and when current retailers are loosing money on gasoline to the tune of $0.01 to $0.02 per gallon due to the credit card charges and the price of buying gasoline from the jobbers and distributors (both still in the distribution chain for independents), it is really a absolute “no way” are they going to spend $6,000 per pump to upgrade to alcohol fuels at E85 or M85. The blenders credit never makes it down to the E85 pump/station, but stays with those far upstream of them. Figure out what a 3.5% credit card fee amounts to on $3.85-$4.50/gal gasoline, and you cannot blame these station owners to be complaining. Discover is higher yet, and AMEX is even higher than Discover. The real value here is for Methanex to get cheap product into the mix and get to the consumer if they can deliver cheap methanol. You can find powerpoints by the Methanol Institute showing how cheap M85 would be at the pumps if Methanex can get in the door. If you take M85 and compete with E85 (with or without subsidies) you watch Methanex and other major producers balance sheet sky rocket. If you sell M85 at $2.50 per gallon while E85 is $4.00 and Gasoline is $4.25 don’t think Methanex will not be a winner in this deal. The consumer will win as well…as they rush to modify their engines with kits and line up for M85 like they do in China. The China example is working like hot cakes off the griddle. It does not work with ethanol, but they line up for methanol…and will continue as oil prices rise. I agree it is good for consumers….they need a choice. However, I don’t want to hear all this mumbo jumbo about how many American jobs it is going to create, nor how it is going to eliminate crude oil imports and remove us from the grips of OPEC. Imported methanol or imported crude oil is going to be the issue with me…and this is only because I’m biased toward our own technology value. I hope when I’m labeled a hypocrite for promoting methanol and the open fuel standards act people realize it is because of our technology and our desire to get into the consumers. We absolutely cannot compete with Methanex…this I know. We cannot get press coverage from the Methanol Institute, and certainly there are some other methanol technologies that deserve attention coming into the market. I hope we can scale up fast and furious to get cheaper and cheaper methanol. It is one thing to claim you can make $3.44 algae oil, and cheap diesel fuel, jet fuel, etc. It is another thing to make $1.00 or less methanol in America to compete with importers. Read the ADM/Methanex lawsuit. This battle is nothing new. Then look at China and their methanol industry. They will bring methanol to America and sell it at Wall Mart stores…just watch. It is all about scale of technology, access to the pumps and politics in Washington! Once you see who the players are behind the OFSA back on the books…it is politics at its finest…and some will argue if we don’t pass the legislation soon we will all be killed by terrorists and evil will be coming to every neighborhood until we pass that legislation to protect the American people. I don’t believe it, but call me hardened to the press releases and video’s on the topic. WHOOPS sorry mods, having a laptop meltdown apparently. Let’s try this again. No worries; I fixed it. I can tell from experience that they are against specific renewable energy projects in their backyard. Part of it may be that, but it’s also the pure ignorance some people display by saying silly things such as, ‘we can add more wind power so we don’t need oil.’ I think that’s why so many people will have a hard time coping with a liquid fuels crisis, they seem to have this notion that all energy is currently interchangeable. If you sell M85 at $2.50 per gallon while E85 is $4.00 and Gasoline is $4.25 don’t think Methanex will not be a winner in this deal. The consumer will win as well…as they rush to modify their engines with kits and line up for M85 like they do in China. So are legal issues the only thing stopping Methanex from opening up stations to sell M85 and modify autos to run on it? China and the U.S. competing to import the same transportation fuel has a familiar ring to it…. How do I go long on Methanol futures? Pay less? Where are the alt fuels that are cheaper than gasoline? Thomas, you did say that consumers would pay a premium for “standardisation”, which means, by definition, that “unstandardised” is less. If the alt fuels are cheaper, at least some will use them. The flex fuel drivers are a good example – many will not use E85 regardless of price, and others know the energy/price comparison, and will make their choice according to the pump price of the day. Last month, wholesale methanol in the US was $1.28/gallon – that is the equivalent of wholesale gasoline at $2.60/gal, and the current price is $2.99. Of course, once methanol starts being widely used as fuel, we can expect the gap to close, and it will likely track gasoline prices similar to how ethanol does. Any benefit that might be gained by using methanol instead of oil, will be lost if the methanol is imported! I do not know the answer to either question. I’m researching the first one now. What I learned today about the biodiesel market and how it is coming back to life has surprised me. I guess mandates will drive the price up of anything in short supply, and I now understand why someone gets high prices for algae jet fuel. When you have to buy it, like biodiesel now, things just take a profit life of their own. Mark, I would not leave it to the Open Fuel Standards Act passage to insure access to these consumers for either mixed alcohols or domestically produced methanol. …..I think we should not be blinded by the press releases and press statements without doing more research on who is behind the legislation and why. …..The real value here is for Methanex to get cheap product into the mix and get to the consumer if they can deliver cheap methanol. …..If you take M85 and compete with E85 (with or without subsidies) you watch Methanex and other major producers balance sheet sky rocket. …..The China example is working like hot cakes off the griddle. Walt: It seems that only a couple of years ago China quietly became the world’s largest producer of C1 MeOH. Before that, Canadian Methanex was apparently the largest giant in this global ‘chemical’ industry. Methanol is normally classified as a base chemical. In fact MeOH is the largest volume chemical sold on the planet today. MeOH is primarily used to make plastics, plastics, more plastics, paints, varnishes, thinners, etc. Methanol also powered the Indy 500 Race Cars as the choice “neat fuel” for 37 years until it was recently replaced by two-carbon corn Ethanol – obviously a political move. What China is now accomplishing with Methanol as a gasoline oxygenating blendstock is rather incredible. This splash-blending technique with the world’s simplest and lowest cost ‘MeOH fuel alcohol’ could have been implemented 80-90 years ago anywhere on the globe — yet it was not. Who controls market monopolies enough to prevent the simplest, lowest cost fuel alcohol to make its way into automobile fuel tanks? Today, amid present and very real climate changes, arbitrated Peak Oil volumes, Gulf Gusher oil spills, wars over oil, crude oil selling for $115+/bbl and NOW — civilian populations rioting against their dictators throughout the entire Middle Eastern oil producing region – while China quietly and effectively implements C1 MeOH into their public transportation system. China made the decision to build MeOH plants asap about four years ago to avoid food vs: fuel issues and NOT pursue batch fermentation to produce EtOH. I find this new ‘Chinese Methanol implementation’ even more interesting because there is almost ZERO awareness of this fact by the U.S. public as all sorts of political rhetoric continues to be bantered about concerning food vs: fuel and subsidies provided to blenders splashing corn Ethanol into the domestic gasoline pool. On this blog we’ve previously experienced disinformation from shills concerning Methanol’s toxicity, etc… Now we hear views saying MeOH is NOT compatible with present day fueling systems… Maybe we need to simply ask what China is learning from their corner gasoline station setups? Or inquire about how older Chinese cars/trucks/small engines are performing when combusting these brand new methanol/gasoline blends. Most motorists do not understand the differences between C1 Methanol and C2 [corn] Ethanol. These molecules are only ONE carbon atom different. Yet the feedstocks which produce them and the chemistry sets employed to formulate these two [lower] alcohols are as different as night and day. Both of these lower alcohols exhibit 107 or 108 octane yet their BTU’s are more separated at 56,000 and 75,500. [Repeat item from me on this blog.] MeOH features 50% oxygen concentration to EtOH’s 33% oxygen content. 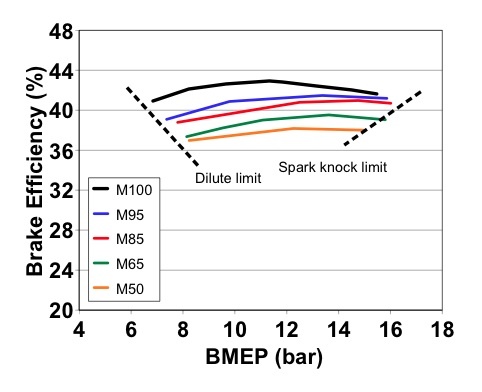 We’ve previously discussed here the fact that when properly adjusted for air/fuel ratio and advanced spark ignition – that neat methanol performs even better than gasoline does when piston cylinder compression is advanced from typical 8.5 to 1 in gasoline ICE’s all the way up to 16 to 1 or even higher. The best ‘neat methanol or neat ethanol’ engine already exists. It is the standard high compression Diesel engine of today. The easiest factory retrofit would be to add spark ignition back to this same Diesel engine design as with all gasoline ICE’s of today. As a motorist, I would certainly like to experience the increased engine torque of either MeOH or EtOH being cleanly combusted as a neat, substitute fuel in a modern-day Diesel engine. And as many folks might agree, following behind a large or small diesel truck on the highway which is now emitting a clean, biodegradable exhaust emission — would be preferable to inhaling uncombusted, sooty black diesel exhaust as we are all very familiar with. The next best thing here is to mandate FFV chips as standard equipment on new gasoline powered cars and light trucks. D) new Municipally-Owned Citizen Cooperatives choosing to recycle and cleanly gasifiy their own municipal solid waste products into profitable new volumes of biodegradable fuel alcohol(s). Today – I’m glad that we are having some public discussion concerning the roots and viability [or not] of possible Federal Open Fuel Standard mandates to require simple, low-cost FFV chips installed in all new gasoline powered cars and trucks. Personally, I wish this were mainstream discussion tonight on CNN, Fox News and the traditional Radio & TV news networks. Joe & Jane Public ARE painfully aware of what $115 crude oil is doing to their family budget. They are more aware of this fact than they seem to be aware of their own tailpipe emission profiles OR the root cause today for multiple wars and Arab populations rioting on this planet. Stronger BTU and higher octane E4™ ENVIROLENE® mixed alcohols presently isn’t germane to new FFV chips on all new cars being called for in the Open Fuel Standards Act debate. Yet this formula-patented, stronger BTU and higher octane E4™oxygenate WILL become calibrated as volumes of this stronger and less expensive new fuel alcohol begin working into the marketplace. Yet I’m referencing something here which will take a handful of years to accomplish. As others have learned – you don’t build new stainless steel GTL fuel chemistry sets overnight. Yet in a decade, such new GTL fuel synthesis facilities could begin circling the globe and owned by multiple nations and financiers – some municipal based. E4™ GTL catalytic synthesis is accomplished using basically a 90-yr. old design of MeOH GTL thermal chemistry set. A complete change-out of active catalyst is made then stronger BTU, biodegradable Higher Mixed Alcohols are synthesized via GTL methods at nearly 2x the efficiency which MeOH is itself produced. Walt: I read you loud and clear that the Open Fuel Standards Act going beyond ethanol blends would be something which politically originates within the methanol industry. Let’s just all become more aware here / and consider adding even higher and more effective calibration to such a new FFV chip being called for. In conclusion: I agree with others that ‘fuel price’ at the pump will become the prime motivator for consumers even more so than ultimate engine performance and resultant emissions profiles. I personally believe it is true that Americans and other global citizens CAN have their cake and EAT it too amid Peak Oil declines. Yet the motoring public as well as 99% of our elected politicians – are not yet aware of the mechanisms to produce decentralized and appetizing new cake. Again, this isn’t rocket science here. Joe & Jane Public need to be honestly educated and this is where news stories and documentary films can fill the gap. I’ve had grade school children understand what I’ve just described after a simple dog & pony demo. Thus on to the next day… Best of luck to each and every concerned citizen who breathes air, purchases liquid fuel and commutes from place to place, be it via ground or air. It seems oil is the weapon of choice…but I guess my question is two fold. The Open Fuel Standards sent out an email last night to frame the discussion, with a link to of the key people involved with the OFSA legislation. Center for Security Policy, and the author of Energy Victory, he compares the Open Fuel Standard with another bill that focuses on natural gas cars. Americans Solutions Act,” or “NAT GAS Act” for short. The other is H.R. pieces of legislation are very different. If we promote methanol imports from China and Methanex what value will America receive beyond tax savings over that burden imposed by OPEC according to Robert Zubrin? I’m all for any tax reduction on the American people and giving the politicians in Washington limited power to tax and spend. It sounds like importing more methanol from overseas is just the ticket according to the legislation of OFSA! and gas industry the hardest. If the anti-bribery legislation FINALLY being passed in the UK is going to effect the oil and gas industry the hardest, does this mean that all of this bribery business should be directed at OPEC ministers? I could think of a few countries (American executives not excluded) that refuse to do business unless a whole latter of people are bribed to get into the transaction. Unfortunately, those countries are not members of OPEC and their executives are in suits and ties. It is good that UK has finally (after all these generations) agreed to stop bribing politicians and government leaders legally to win contracts and influence people. Does this mean that it will stop? Absolutely not. Now, everyone will legally lobby the governments, and the campaign money will flow! On this issue of toxity to auto and small engines, I have heard that a UK company signed an agreement with one of the major methanol/gasoline distributors in China to add a chemical to the methanol which eliminates or reduces (I don’t know what is true) the problems. Of course, you cannot drink methanol and so it will still be toxic to mankind, but we need to approach any chemical or fuel with caution about drinking it. My hope is that we will be able to pass good legislation and support more methanol usage…just for the right reasons that give Americans a choice at the pump, and allow domestic producers to compete without having to build multi-billion dollar plants which will never be approved in America. I don’t think it is unreasonable…but it might be unrealistic. In conclusion: I agree with others that ‘fuel price’ at the pump will become the prime motivator for consumers even more so than ultimate engine performance and resultant emissions profiles. I personally believe it is true that Americans and other global citizens CAN have their cake and EAT it too amid Peak Oil declines. Most of this controversy article after article deals with the debate between MTBE and Ethanol, and you can read how state by state it worked. With MTBE prices rising worldwide…think about Methanol prices at $450/tonne right now, and why. Should we become dependant on imports from China and Methanex? mid-July 2008, according to ICIS data. FOB Singapore, the data showed. Does anyone here bother to use a calculator? That 1 billion gallons a year useage quoted in China is the energy equivilant to about 32,600 barrels a day of gasoline. Or to put it another way a large sized single oil well. The US alone consumes about 25 million barrels a day of oil, so this is literally a drop in the ocean. For this reason alone, any volume of methanol sold would instantly track the energy price of gasoline less any “inconvenience” discount simply due to the fact that it is a tiny sector of a much larger market with more than adequate demand. Considering we have plenty of uses for both the main methanol feedstocks (coal & nat gas) why bother? Even processed flare gas methanol would be fairly useless as a fuel as there is a large enough higher margin demand for it as a feedstock. I fail to see why you would want to use it as a fuel. I would be more than happy to supply the 1 billion gallons a year of methanol in the American market, and let the rest argue it is worthless to the gasoline sector! Rome was not built in a day, and did practically collapse in a day. Do you ever bother to use Google? Yes, the Chinese fuel methanol usage is only about 30,000bpd equivalent, because they are just finishing a ten year development project on coal to methanol as fuel. The concentrated all their efforts in Shanxi province – the centre of their coal industry, and were determined to get it right, before they scale it up – a commendable apparoach. As for methanol production, they went from 3m tons in 2003 to producing 17m tons in 2010 [source] – that is quite a ramping up of capacity. 88% of it is still used for non fuel chemical purposes, but they are now working on purpose built plants to produce methanol fuel. An interesting read on the 10yr development of their methanol fuel program, is here [Mark, Walt, highly recommend if you haven;t seen this already]. The program was kick started with American co-operation and by Ford donating a methanol FFV for them to play with! And, your feedstock is not weather dependent, or using any food material – a big issue in China. I fail to see why you would want to use it [methanol] as a fuel. Why, you would use it because it will likely be cheaper than gasoline, and because it is better! Alcohol fuels, in an engine tuned for them, are more energy efficient, and cleaner burning, than gasoline. And , if you are building or modifying engines specifically for alcohol, you can use much higher compression ratios getting more power ad better fuel efficiency. Paul, your whole quote was really excellent. I pasted it and sent it to colleagues at some of the super majors, some bankers and my entire private email list. The past two days I was visiting a biodiesel facility and also looking at the numbers for blenders of gasoline and diesel. The impact some old Bush legislation is now having on the industry, and found everything to be very very interesting. I must admit that biodiesel and methanol could make a breakthrough much sooner than other advanced biofuels, but in light of where all the money is being invested I suspect everyone is focused on using mandates to sell fuel at any market price due to lack of mandated supply, and required demand. A traders dream from what I saw on the trading floor two days ago. The good news is that the VC’s are likely going to pull out of this looking like some really smart money! The no so good news for me is I think I’m going to bow out of posting further on the blog. I think that I have given methanol a positive push along with others, but I am convinced the technology sector is being driven by a lot more politics than practical solutions, and this last trip gave me the hard numbers I needed that justified why technology is not a factor in the hundreds of millions going into these processes. I noticed this press release recently and using that background with what I learned about the ethanol mandates it made sense how they can take trash, convert it to methanol and then convert it to ethanol as a business model. gasification and catalytic synthesis. Image credit: Enerkem. investment in Enerkem is now $130 million. converted into ethanol or other chemical feedstocks. I understand the ethanol mandates do not allow corn based ethanol to be included, except for corn oil can be used for biodiesel and qualify, and so these models above make sense. You don’t raise $130 million if you cannot make money somehow. Q: Who are your leading investors? leading investors in Virent, in addition to several angel investors. It dawned on me that the $1.56/gal. gasoline that we estimate we can make from flared gas or natural gas at min. 10 mmscfd feed rates is going to be not only not taken seriously, but never make an analyst headline. Some on our team recognize that our posting is only hurting our reputation and after Robert took down our video because I made him upset we need to focus on the technology not the policy at our early stage. I like the idea of being a bit of an underdog but there is a time when you have to take the beating and go back to work in light of the policies. Mandates may not drive all this investment forever, and until that changes we need to look at what fuel choice at the pumps could mean for those with alcohol based fuels. I see potential, and your paper today has tipped us over the edge that if China/Methanex is doing it, we can too. Please keep up dated off line. Your comments have been excellent, always! A woman of her age and education once thought that oil was a four letter word? Sounds somewhat naive. Oil replaced slavery. It quite literally sustains the lives of almost seven billion people. There would be no modern world without that compact source of liquid energy. It’s time to move away from it as there was a time to move away from buring our forests for energy.